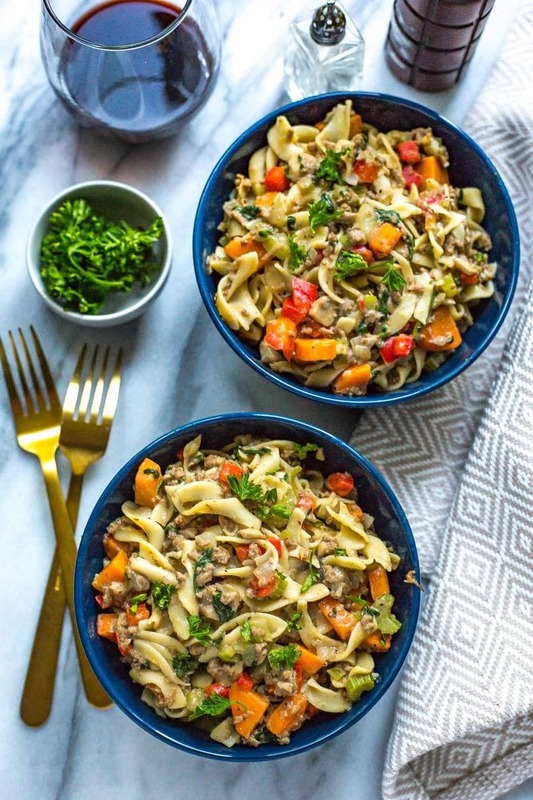 This Healthy One Pot Beef Stroganoff is a delicious 30-minute dinner idea that is also freezer-friendly. 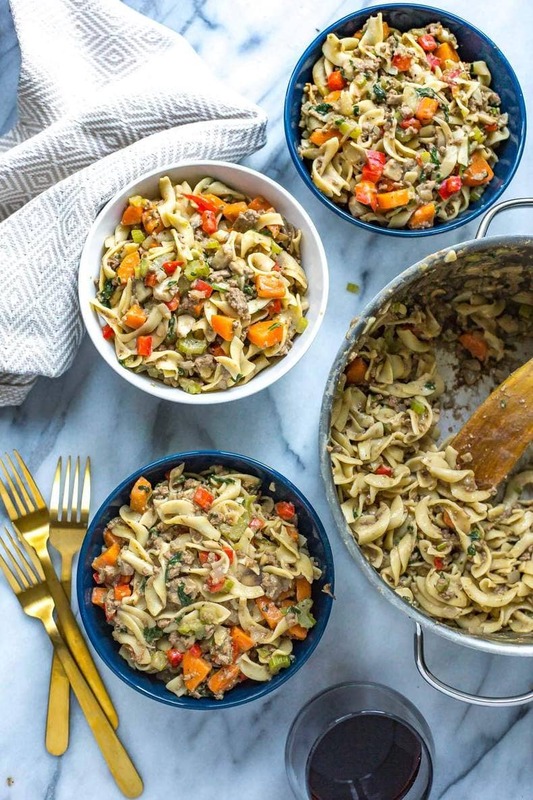 Packed with veggies, this lightened-up stroganoff is perfect for busy weeknights! 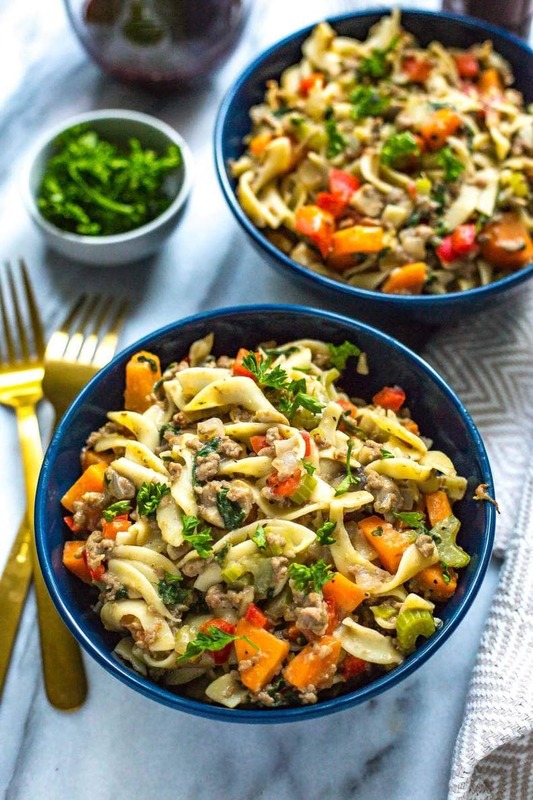 Move on over Hamburger Helper, we've got a new favourite one pot dinner in town: Healthy One Pot Beef Stroganoff! Honestly, I don't even know why Hamburger Helper became such a thing back in the day. While I can definitely be a sucker for all things processed food (I'm known to eat a whole box of Kraft Mac n Cheese to myself every once in a while…), I just don't even understand what the convenience factor was behind it. Like isn't that the point of most boxed/frozen food? The fact that it's super easy and basically takes zero time to prep dinner on a busy weeknight? If you're looking to get serious about meal prepping and make more delicious recipes like these, you HAVE to sign up for my free 5-day challenge below! To me, having to cook a whole pound of ground beef in addition to potentially throwing in extra veggies on top of a boxed dinner actually seems like a lot more work than is necessary. You're honestly better off cutting out the middleman and using simpler, less processed ingredients like beef broth, red wine and sour cream. 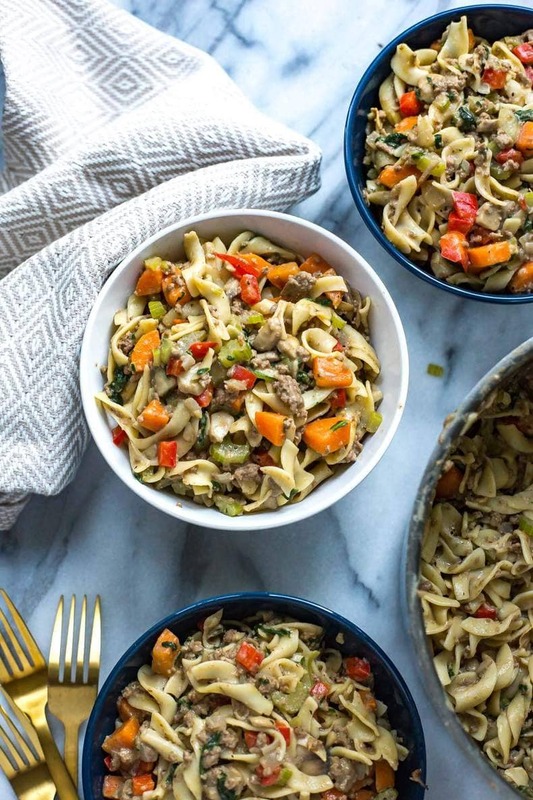 Because really, those three ingredients are the secret to this Healthy One Pot Beef Stroganoff. Aka, there is no secret to cooking from scratch. And yes I know these are kind of “indulgent” ingredients but a tiny bit goes a long way, and I can guarantee you it's a lot better than using a dried, packaged sauce mix. The thought of boxed dinners is also funny to me because I'm really not the average person when it comes to weeknight cooking. It's so hard to make anything that is just single serving anyway because you always end up overestimating how much you need of something and it's easy to chop up a whole red pepper for one meal without even thinking about it. I figure you're always bound to have leftovers or more than one serving of something no matter what, and it's definitely more efficient to cook this way whether you're cooking for just yourself or others. So as I was saying, me being the crazy person that I am, every meal has to be gourmet and fancy. That's just the way it is. With fall starting, you're bound to feel less motivated to cook and take care of yourself and that means dinners have to be beyond easy, and take no time, and give you meals and meals for days. 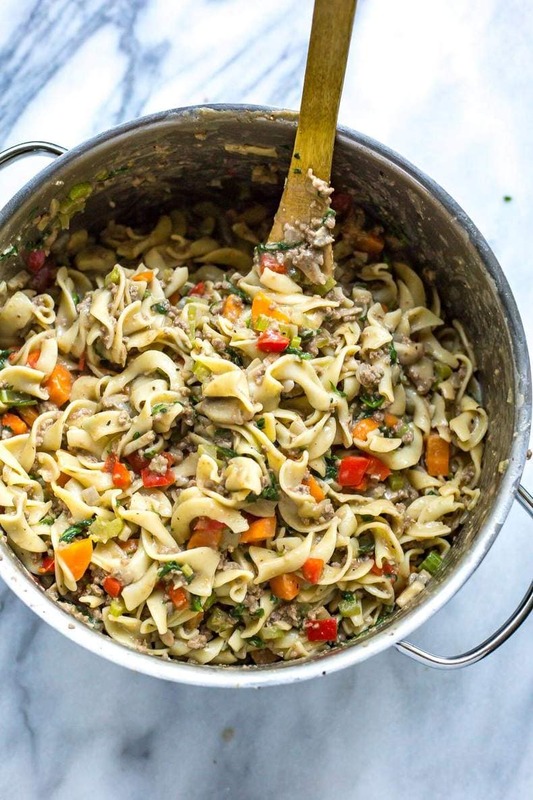 And it helps, this Healthy One Pot Beef Stroganoff is freezer-friendly too. Freeze in little foil containers you can find at the dollar store to make healthy “TV dinners” – take em out of the freezer about an hour before you wanna eat and heat them up in the oven for about 45 min to an hour while you kick back and relax. Can't you just feel the heat of the oven and the aroma of comfort food filling the house while you're bundled up watching your fave shows after work? Now THAT'S worth the time it makes to put together this one pot meal. 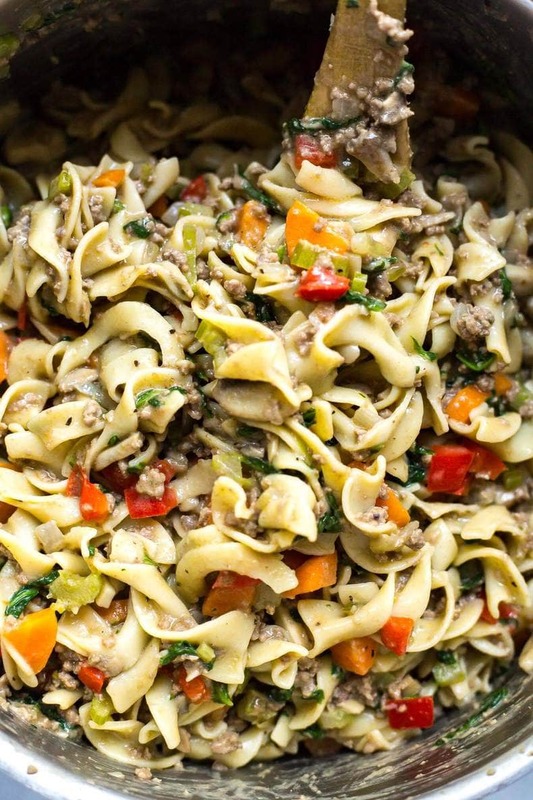 Will you be making this Healthy One Pot Beef Stroganoff? I swear this stuff is way better than any of that boxed stuff and it's a super easy way to get a ton of veggies in all at once – no side salad even required so say goodbye to a ton of dirty dishes and lots of clean up with this recipe! Grab some Glass meal prep bowls if you plan on packing this up for lunch! And of course I get all my grass-fed beef from Butcher Box! Heat olive oil over med-high heat in large pot. Add onions/shallots and garlic, sautéing for 1 min until fragrant. Add mushrooms, carrots and celery, cooking for about 3-4 min until mushrooms start to release liquid and veggies are tender. Add ground beef and cook until browned, then add red wine, salt and pepper and flour, tossing to combine. Add beef stock and cooked noodles, bringing to a boil and cooking for 1-2 minutes until mixture starts to thicken. Stir in sour cream, red pepper and spinach, then remove from heat. Serve and enjoy! Freeze leftovers in individual portion sizes in glass bowls or foil containers. If using foil, reheat in 375F oven for 45 min. If using glass bowls, reheat in microwave on high for 5-6 minutes, stirring halfway through and adding 1-2 tsp of water or milk to add more moisture. 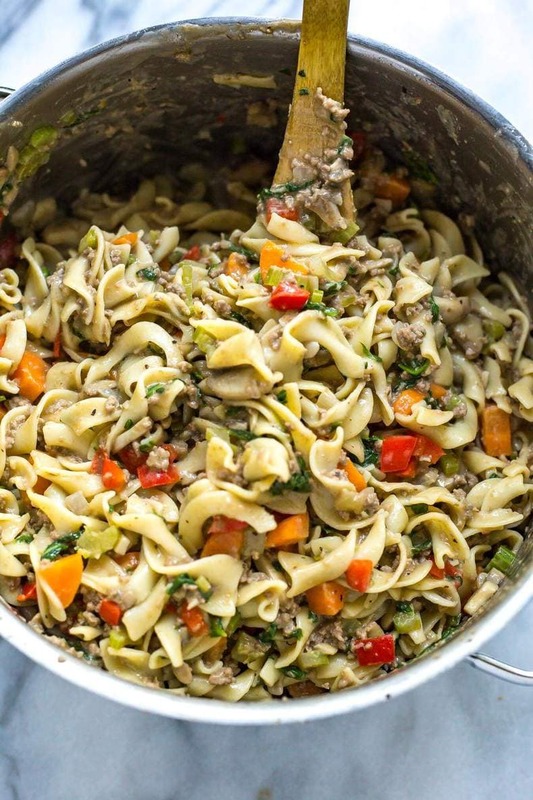 Making this because it looks awesome….but had to guess on the garlic and egg noodle amounts as they are not listed in your ingredients list! I am so beyond excited right now. FINALLY a way I can eat “hamburger helper” without feeling totally guilty afterwards. Saving right now! I finally got to make this healthy beef stroganoff this past weekend and it was such a hit!! Can i post it on my blog? Thanks for sharing! Hey Jill! I’m so happy to hear that!!! If you remake it with your own photos feel free to post away with credit 🙂 If you’d like to repost it you can to use a photo of mine and post the ingredient list only then link to the instructions on my blog. Thanks so much and so glad you liked it! I’m trying to meal prep… If I was to make this ahead, do I completely make everything and then reheat? This beef stroganoff looks absolutely fantastic. Beautiful photos, too. I look forward to trying this. Thanks for sharing, Taylor! Have you tried this one in the Instant Pot? My picky teenage daughter picked out this meal and I made it. She loved it. Matter of fact, everyone did. I will be making it again. Only question, when do you add the red pepper? Yay I’m so happy to hear the family loved it Laura!!! Sorry for the lack of instructions about the red pepper…I usually stir it in at the end with the sour cream and spinach since it’s cut up small and tenderizes fast (updated the recipe to reflect this) but you can add it in when you’re cooking the other veggies too. Hi, is red pepper a red bell pepper? Hey Caitlin! Yes it is! Hi! This recipe looks so delicious!! My boyfriend is kosher, so we try not to eat dairy and meat together. Any suggestions for how to make this without the sour cream/greek yogurt? Should I just look for DF versions or could the cream be skipped altogether? Is really a homemade Hamburger Helper tasting meal, rather than beef stroganoff. The ground beef and added veggies took away from the quintessential stroganoff taste. It wasn’t what I expected. It tasted fine. My brother had two helpings, just know that it’s more Hamburger Helper tasting than anything. Oh yes he gobbled it down. No complaints at all. I just wanted to provide a review from a reader who prepared it so others aren’t preparing this delicious meal with classic stroganoff in mind and possibly feel let down. My mistake – you did in fact make reference to Hamburger Helper. . I admire you – sharing your recipes for ppl to critique. Keep up the good work. Aww thank you so much Dina – I really appreciate your kind words and definitely love all comments 🙂 So happy you guys enjoyed! You know what, I redact anything negative I posted. Because I just warmed this up after being in the fridge for 2 days – and guess who had two helpings? Yours truly! It’s delicious dear. Definitely a dish that gets better and better. This looks great, and I want to prepare the dish. However, the sodium is really high. Is there any way this can be made diabetic and high blood pressure friendly? Thank you. Hey Paulette – you could try cutting out the salt entirely as the broth may be enough! I’m not specialized in making any recipe diabetic-friendly but that is one way to reduce the sodium level. Hope that helps! How much is “one serving” from the nutrition label? You will need to divide the recipe into six portions and each one is a serving. Unfortunately I can’t provide serving size by specific measurement.